An independent kingdom for much of its long history, Korea was occupied by Japan beginning in 1905 following the Russo-Japanese War. In 1910, Tokyo formally annexed the entire Peninsula. Korea regained its independence following Japan's surrender to the United States in 1945. After World War II, a democratic-based government (Republic of Korea, ROK) was set up in the southern half of the Korean Peninsula while a communist-style government was installed in the north (Democratic People's Republic of Korea, DPRK). During the Korean War (1950-53), US troops and UN forces fought alongside ROK soldiers to defend South Korea from a DPRK invasion supported by China and the Soviet Union. A 1953 armistice split the peninsula along a demilitarized zone at about the 38th parallel. PARK Chung-hee took over leadership of the country in a 1961 coup. During his regime, from 1961 to 1979, South Korea achieved rapid economic growth, with per capita income rising to roughly 17 times the level of North Korea. South Korea held its first free presidential election under a revised democratic constitution in 1987, with former ROK Army general ROH Tae-woo winning a close race. In 1993, KIM Young-sam (1993-98) became the first civilian president of South Korea's new democratic era. President KIM Dae-jung (1998-2003) won the Nobel Peace Prize in 2000 for his contributions to South Korean democracy and his "Sunshine" policy of engagement with North Korea. President PARK Geun-hye, daughter of former ROK President PARK Chung-hee, took office in February 2013 and is South Korea's first female leader. South Korea holds a non-permanent seat (2013-14) on the UN Security Council and will host the 2018 Winter Olympic Games. Serious tensions with North Korea have punctuated inter-Korean relations in recent years, including the North's attacks on a South Korean ship and island in 2010, nuclear and missile tests, and its temporary closure of the inter-Korean Kaesong Industrial Complex in 2013. South Korea over the past four decades has demonstrated incredible growth and global integration to become a high-tech industrialized economy. In the 1960s, GDP per capita was comparable with levels in the poorer countries of Africa and Asia. In 2004, South Korea joined the trillion-dollar club of world economies, and is currently the world's 12th largest economy. Initially, a system of close government and business ties, including directed credit and import restrictions, made this success possible. The government promoted the import of raw materials and technology at the expense of consumer goods, and encouraged savings and investment over consumption. The Asian financial crisis of 1997-98 exposed longstanding weaknesses in South Korea's development model including high debt/equity ratios and massive short-term foreign borrowing. GDP plunged by 6.9% in 1998, and then recovered by 9% in 1999-2000. South Korea adopted numerous economic reforms following the crisis, including greater openness to foreign investment and imports. Growth moderated to about 4% annually between 2003 and 2007. South Korea's export focused economy was hit hard by the 2008 global economic downturn, but quickly rebounded in subsequent years, reaching 6.3% growth in 2010. The US-Korea Free Trade Agreement was ratified by both governments in 2011 and went into effect in March 2012. Throughout 2012 and 2013 the economy experienced sluggish growth because of market slowdowns in the United States, China, and the Eurozone. The administration in 2014 is likely to face the challenge of balancing heavy reliance on exports with developing domestic-oriented sectors, such as services. 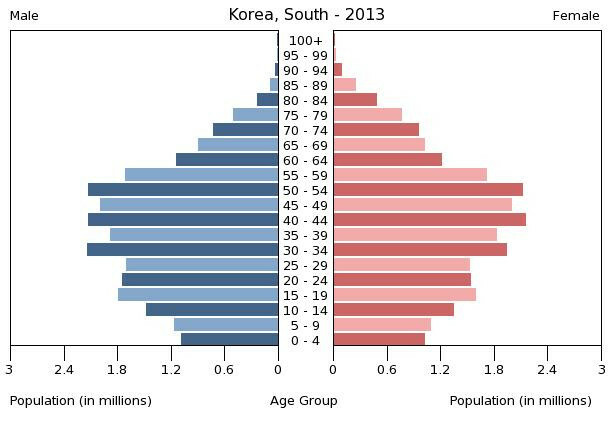 The South Korean economy's long term challenges include a rapidly aging population, inflexible labor market, dominance of large conglomerates (chaebols), and heavy reliance on exports, which comprise about half of GDP. These are the 50 largest cities of Korea, South ordered based on their number of inhabitants.